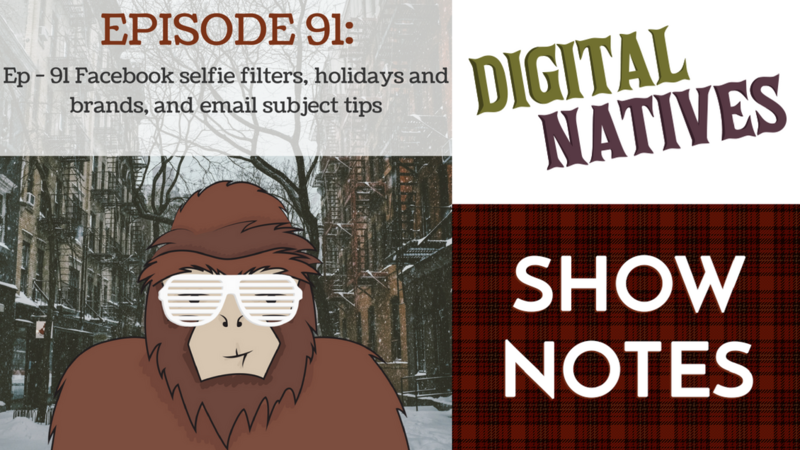 This week on Digital Natives, Kyle, Min, and Mitch talk about Facebook’s upcoming selfie filters. How to align your brand with the holidays. And email subject line tips to get your emails opened and read. Facebook has been working on bringing selfie filters to its platform. These selfie filters will take filters to the next level with emotion-based automatic filters. Learn more and see what we think about them in this episode. Kyle shares how brands can align themselves with holidays. Which ones are worth supporting or recognizing and which ones may shed a negative light on your brand. Mitch shares a list of email subject headlines that will upgrade your emails from generic to personalized.